You’ve hosted your app on FileMaker Cloud, and users can collaborate with it from their own devices. Now you’re ready to learn more about the full set of features that come with FileMaker Cloud and how to access those features from the Admin Console. Backups are scheduled and run automatically. The environment defaults with the “auto-maintenance” feature set to “on” – which means the system will periodically restart itself outside of business hours, when users aren’t connected, as a good-hygiene practice. Still, there are many settings and observations available to you in the Admin Console, and you may choose to adjust them yourself. You’ll learn how to monitor which users are connected to your app, and how they’re connected. You can communicate with users from the admin console, and disconnect them if needed. You’ll see where the last two weeks of automatic backups are stored, and learn how to keep one on file for longer-term reference. You can check how much storage you’re using, so you know if you’re on the right instance type. As you get more comfortable with the FileMaker platform, you’ll likely use more of the many features available to you. 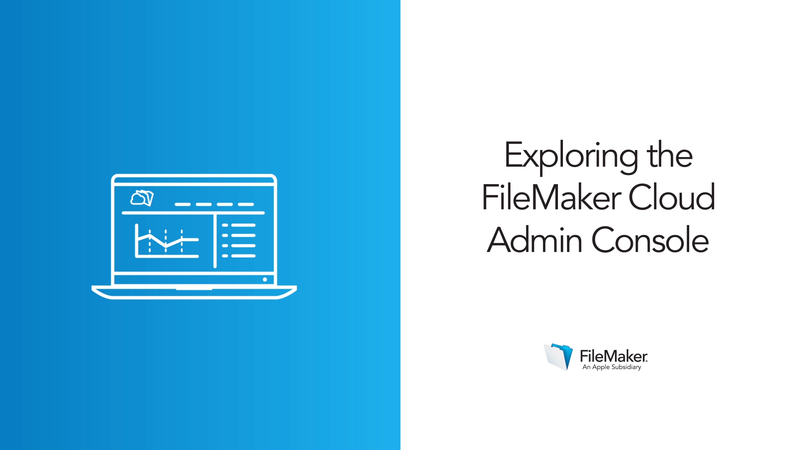 The Admin Console is the hub for many of these features, from the common (such as downloading copies of FileMaker Pro for your users) to the more advanced (such as connecting to outside data sources).